Even before your eyes open in the morning, what are your first conscious thoughts? Do you start thinking about what’s on your to-do list? Do you begin to worry about situations in your life? Do you start the process of getting stressed about what’s on your plate? 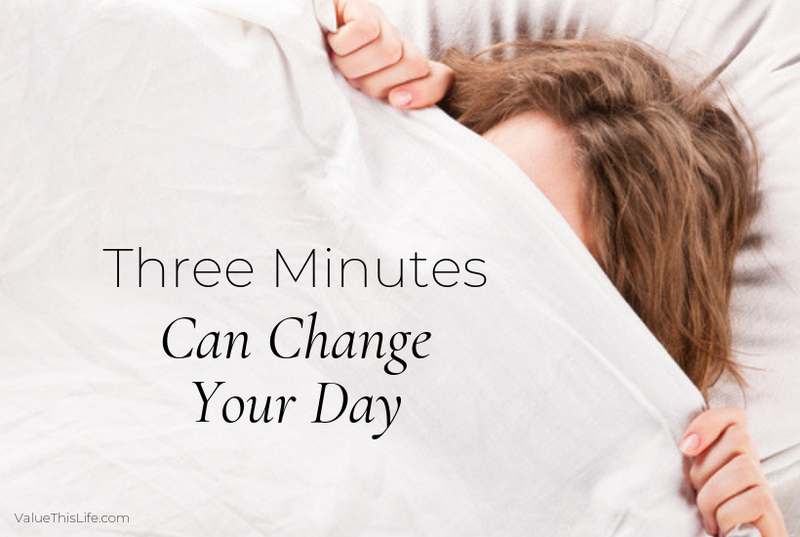 Let me show you how just three minutes can change your day. Those first morning thoughts set the tone for your day. They color your perception of the day ahead, and begin the secretion of chemicals that affect the DNA in your cells. Yes, the cascade effect of your thoughts has an impact on your cells. The good news is that you have a choice about what to think, even when you first wake up. You can create a new habit of first-thing-in-the-morning thinking. Take the first three minutes to think a special kind of thoughts: choose to be grateful, for anything and everything. It’s simple, really. The moment you’re conscious in the morning, begin to think of things you’re grateful for. Take just three minutes to list the things for which you’re thankful. It can be things from the day before, general things in your life, even random little things, like a good hair day. Look around your bedroom. Look at your family with new eyes. Look in your closet. The “quality” of the things you’re grateful for isn’t as important as the heart attitude. You see, sometimes we don’t want to be grateful. We’d rather hang on to resentments and comparisons. We think we have the luxury of complaining, feeling sorry for ourselves, and focusing on all the things that are wrong or not enough. It seems hard to be grateful when we don’t feel very thankful for what’s going on in some areas of our lives. God is a Gentleman. He allows us to choose what to think about and focus on, even if our thoughts are going to discourage us, keep us small, make us sick, and damage our relationships. He knows the power of our thoughts, but He gives us the freedom to choose how to use that power. Three minutes of gratefulness is a small but powerful step. It will take a decision, and you’ll have to remind yourself daily as you get started. If you forget and start down the path of undisciplined thoughts first thing in the morning, just switch over as soon as you remember. Don’t shame yourself. Be grateful that you are starting this new habit. This simple choice will begin a new pattern of thinking. You’ll feel more optimistic and positive as you count your blessings daily. Instead of beginning the day on a downward spiral of negativity and ungratefulness, you’ll begin it with an upward boost of positivity and thanksgiving for what’s going RIGHT in your life. It will be easier to go from there to have a good day instead of starting the day with a negative balance in your perspective. Anybody can do this. You don’t have to write anything or mark a chart. Just stay aware of your waking thoughts and immediately shift them to being grateful for a few minutes. If you want to multiply the effectiveness, continue throughout the day to take note of and be thankful for anything and everything. Three minutes can change your day. And it might change your life, too. Thank you so much for writing this. I did it this week and it really made a difference in my attitude! Yayy! I’m so glad you noticed a difference!